It's a first: A man has been arrested for possession of 3-D printed guns, according to a report from Japan's NHK news service. Japanese police apprehended the 27-year-old after he posted video of his firearms online — perhaps not the wisest move in a country with strict gun control laws. The alleged culprit, Yoshitomo Imura, works at a college outside of Tokyo. Investigators found five guns, though only two appeared to be functioning. No bullets were recovered, however (they can't be printed). The man reportedly said he thought what he was doing was not illegal. In a way, it's surprising that it took this long. The first functioning 3-D printable pistol, called the Liberator by designers Defense Distributed, made its debut online nearly a year ago. The U.S. State Department later demanded that the blueprints to be taken down. Thousands could have been printed by now, but even if they have, this is apparently the first time anyone has been arrested for having one. Authorities in the U.K., another place with strong gun laws, did arrest a man on suspicion of printing firearms — but the parts later turned out to be pieces for assembling another 3-D printer. In the U.S. some local governments have moved to regulate 3-D printed guns. 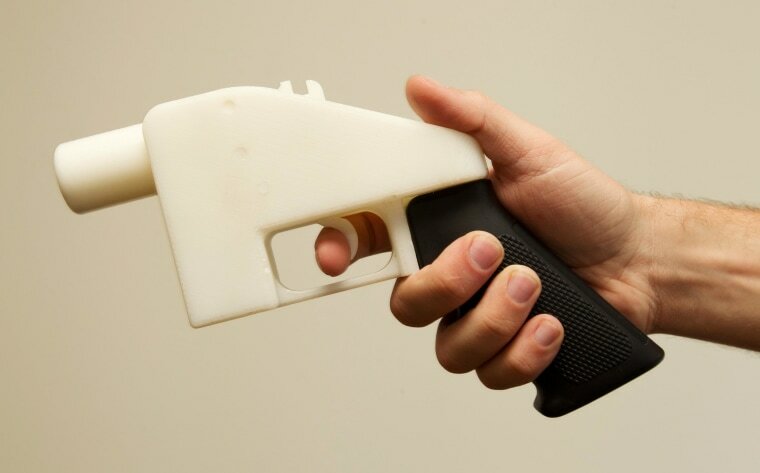 Philadelphia last year became the first city to ban 3-D gun printing.